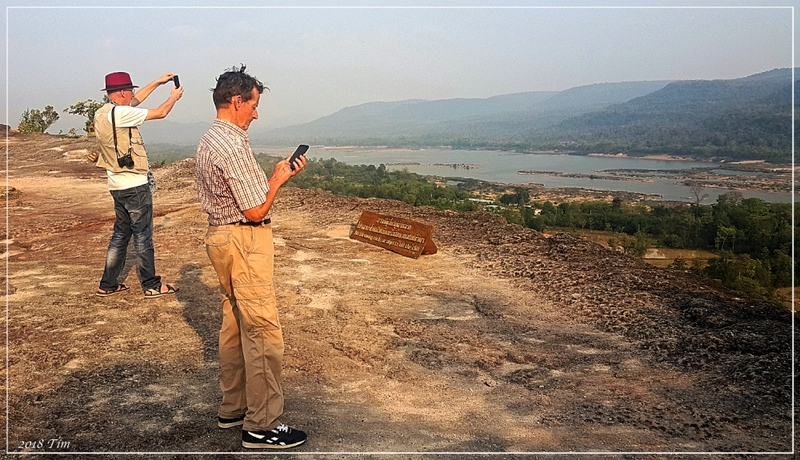 In Pha Taem National Park, not far from the giant mushrooms, is a high cliff over-looking the Mekong river and beyond to Laos. The views from here are excellent, and easily compensate for our failure to get to the overlook of Emerald Triangle the previous day. Ray: I was impressed, Larry. Ray: La vue était impressionnante, Martine. It is something special, isn't it? Ray: I think it is, Elizabeth, and will present further evidence tomorrow. Ray: Yes...good MTB country, Alan, and the road in is good road bike tarmac...in fact the only place I know in Thailand where they have purpose -built cycling lanes on the road. My friend, Koen, uses his iPhone to make multi-image panos which usually work better when iPhone is held in portrait mode...you have a bloddy iPhone and should be aware of this, Techno-Dude! Presumably Thailand and Laos are friendly with each other? Ray: Really in Tourist mode, aren't we...spending more time looking through our devices than just contemplating the loveliness of the place in which we have found ourselves. Thailand:Laos relationship is ok, but not great. Ray: Indeed, Bill...especially the top one as the view is not impeded by the presence of fossils with smartphones. I thought the Mekong was a strange character from outer space in the comic Dan Dare Ray. What a great look out spot. Would it still be considered rainy season? Ray: We are near the end of the Dry season [November - May] which is why the waterfall was virtually dry on Day 1. A fine outlook from way up there Ray. Ray: It is so flat where I live that I rarely get the opportunity for a shot like this, Brian. Ray: A slightly different outlook over the same area tomorrow, Tom. Ray: I am a bit starved on pano opportunities where I live, Ayush, so took quite a lot of shots here.